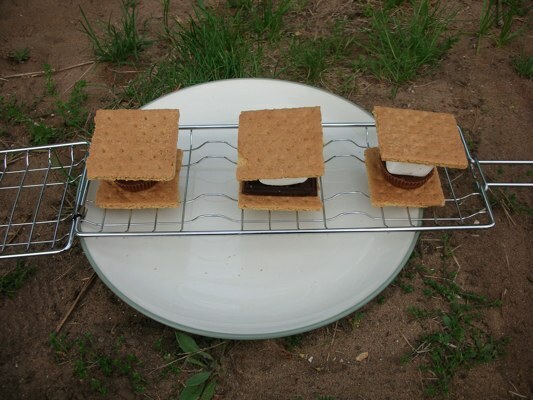 Smores Grill - An Easy Way To Cook Smores? 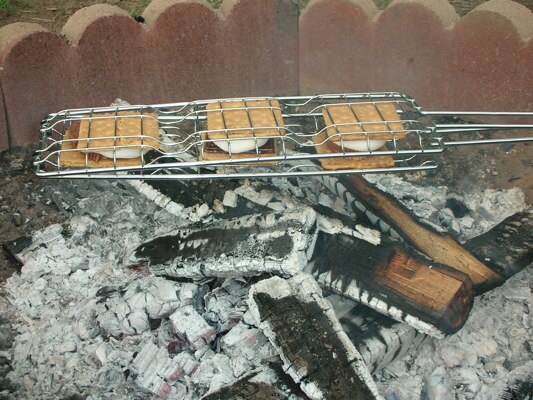 A smores grill is a device specifically designed to cook multiple smores at one time over a campfire, grill or fireplace. The smore is a favorite summertime treat enjoyed by almost everyone. If you like chocolate and marshmallows, you probably love to eat smores. No one knows exactly when the first smore was produced but the first recorded version of the recipe can be found in the publication "Tramping and Trailing with the Girl Scouts" in 1927. The treats were described as "Some Mores" and the name was eventually shortened to smores or s'mores. While walking through a local Walmart store I found something I just couldn't resist. There it was, hanging in the camping section.......the Coghlans Camper's S'mores Grill. A tool specifically designed to cook the perfect smore and with a price tag under $5? I thought it was worth a try. The grill is constructed of chrome plated steel and has a 17 inch handle to keep your hands safely away from the fire. 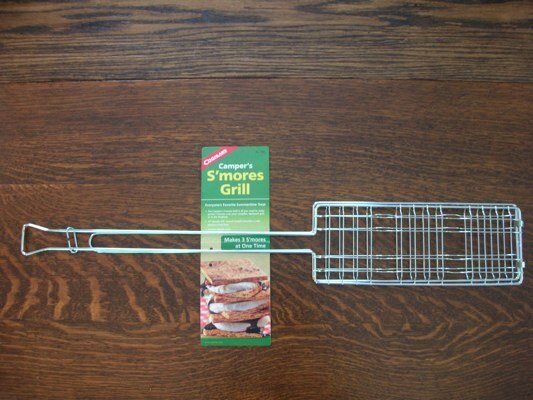 With a total length of 29 inches, the grill allows you to cook three smores at one time. Begin by placing a piece of chocolate and a marshmallow between two pieces of graham cracker. In this example I chose to substitute peanut butter cups for the chocolate on two of the smores. Hold the grill over a hot bed of coals to slowly melt the chocolate and marshmallow. The smore is finished when the graham crackers are lightly toasted and the marshmallow and chocolate are melted. That's it! Three cooked smores that are ready eat. Smores Grill - How Well Did It Work? The grill worked okay......just okay. I found it difficult to "load" the grill with the ingredients without the graham crackers shifting and the uncooked marshmallows rolling off. It was also easy to bust the graham crackers when I closed the grill and placed it over the fire. With a little practice, the process did get easier and overall the grill did the job. Compared to the original way of cooking a smore, the grill did a great job melting the chocolate and marshmallow together. The grill also allowed me to created different smores recipes like Hot Fudge Smores, Banana Smores and Caramel Smores. By loading the grill with different ingredients it was similar to creating a sandwich. Does everyone need one of these grills to create the perfect smore? No, the traditional way of roasting a marshmallow over a campfire will do the job. However, if your looking for a new gadget to take on your next camping trip, the grill is a good investment for under $5.